Taylor Swift and one of the abeckham kids?? 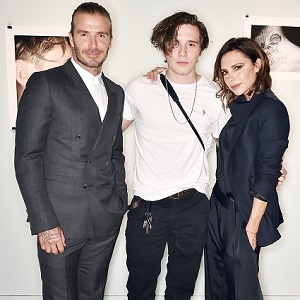 Brooklyn Beckham for the son of a celebrity couple. Dunno about the female singer half of the couple though. I swear..if this is Brooklyn Beckham and Cheryl Cole…I would be mad too if I were V. Geez, as if Liam wasn’t bad enough. Sweet baby Jesus, please don’t let this be Madonna and the Beckham boy. Better question: did this event take place in the US or UK? Beckham kid and Rita Ora. Brooklyn Beckham & Rita Ora. I don’t know why anyone her age would be even slightly interested with a boy of his age. Brooklyn Beckham and Rita Ora – apparently they have had a fling but he has a girlfriend now. Woman: sounds like Tyler Swift but she isnt single so I don’t know who it is. Brooklyn Beckham and Rita Ora? Rita Ora and Brooklyn Beckham. Don’t understand BB’s attraction – especially to a late 20s woman. I mean…he seems more into model types, so a little odd. And also, what does a 30 year old woman see in a 20 year old guy? Rita Ora and Brooklyn Beckham. Bizarre couple. Brooklyn Beckham and Rita Ora! Victoria will not like her hanging around with her track record!! Brooklyn Beckham and Rita Ora……no not a good couple….he looks like a good kid and she is obviously a maneater…. Almost used the nickname anyway. Oops! Absolutely NOT a good couple! Not sure they’re a couple, they run in the same circles though and have loads of mutual friends . The eldest child of David and Victoria Beckham and Rita Ora. Taylor Swift and Brooklyn Beckham? Good couple? No, she’s way to old for him. Rita Ora and Brooklyn Beckham ?